Hello there! Today I am sharing this card that I have made using the Stamp of the Month digi image for May at From the Heart Stamps and it’s called Hamlet PigWit in the Planter! How cute is this?!! If you took part in the challenge last month you would have been emailed this set for FREE! However, you can purchase this in store, or if you spend $10 you can get this for FREE by using the code SQUEAL!!! Challenge rules can be found HERE. Here is the complete set: I used a greeting that I already had in my stash but you get plenty included. While I’m here, I thought I’d show you the 2 FREEBIES that Faith has very generously made available at the STORE! I think you’ll agree these are 2 fab sets with so many great sentiments! That’s all from me for today but remember you have until the last day of the month to link up your creations to the BLOG! For my card I also used: Papers by Anna Griffin – Lizzie, Spellbinders Square Die, Lawn Fawn Scalloped Border Die, Sue Wilson Camelia Die, Dragonfly die – magazine freebie, Kanban sentiment, Card Candi, Trimcraft enamel dots, Spectrum Noirs and Promarkers. Take care and I hope you enjoy the rest of your day! Wonderful creation, Karen! Don’t you love him in the planter? Your papers and wonderful embellies seem to place him right in the garden! I am so glad you are playing along with us! Oh, what a cute card with the pig in the barrel, Karen! Love the pretty colors and embellishments, too! Karen, your Card is super sweet and i the additional flowers fits great with Hamlet in the Planter. Aren´t the new Images FUN ? That is one cute piggy! Great card, again. Sweet! Love the colors and the dragonfly is perfect!! Cute image, colored to perfection, and the pig has just the right shade of pink. Pretty papers, colorful and beautifully decorated with flowers. Cute, cute, cute!!!! 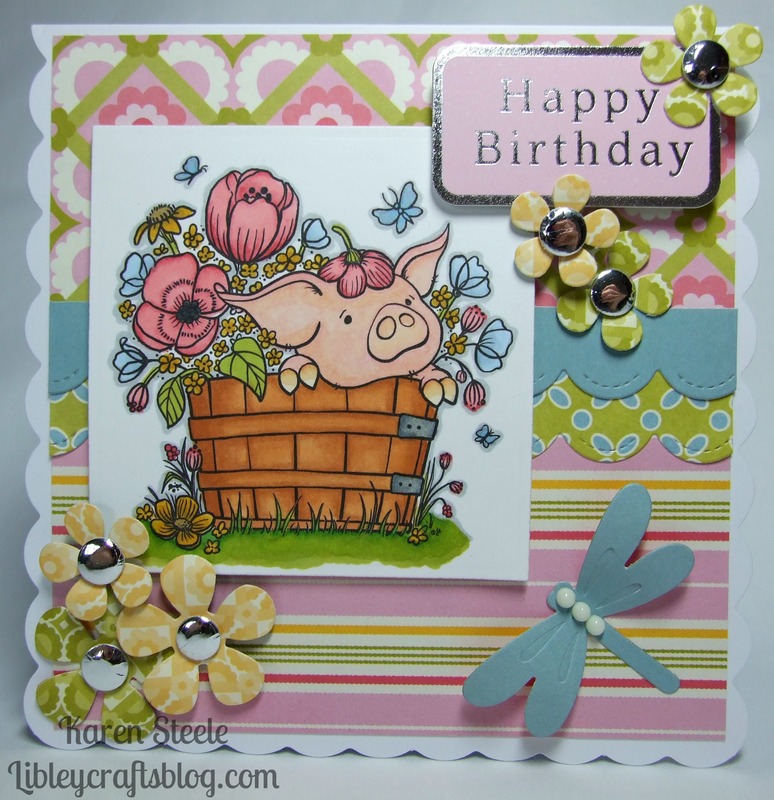 Love the spring colors you used, and that piglet is just too adorable!! Love it, Karen! !